EcoLine® Drilling Rod Grease Featured in New Equipment Digest! Case Histories Highlight Success of Cortec® Water-Based Rust Preventatives for Nearly Two Decades! First Croatian Bioplastics and Anticorrosion Films Plant Launches New Brochure! Cortec's 329 D ES in Easy Spray Formula: Powerfull, Long-Term Corrosion Protection of Your Assets! AFRICORR 2018 "Expanding Cortec's Footprint in Africa"
Save the Date for CorrTango 2018 in Buenos Aires, Argentina! Cortec® VpCI® Additives Make American Coatings Show a Success! Cortec® VpCI® Additives Brochure Offers Customized Corrosion Protection for Metalworking and Hydraulic Fluids! Bionetix® International Successfully Passes ISO 9001:2015 Quality Management System Transition Audit! Cortec's Solutions Rehabilitate Vulnerable Structures: MCI®: Technology Used to Restore Historical Buildings in Europe! Save the Date for Cortec's 2018 Asia-Pacific Sales & Strategy Meeting in Shanghai, China! CortecRus and Cortec® Corporation presented VpCI® Technology at the Seminar Organized by KAMAZ! Success of Cortec's CorroLogic® Solutions, Cortec's Distributor Presserv Nominated for Innovative Technology Award! Cortec® Develops Environmentally Conscious Biobased Grease with Superior Corrosion Protection for Machines and Bearings! MCI® Technology Presented to Major Companies in Southeast European Market! Cortec® VCI Article One of Five Most-Viewed Stories for Oil & Gas Engineering in 2017! Cortec® Corporation Successfully Passes ISO 9001:2015 Transition Audit with No Non-Conformances! CorrVerter MCI&REG; Technology Utilized to Preserve War - Destructed Monument! Cortec&REG; VpCI&REG;-649 BD Fights Corrosion, Scale, and Odor in Closed Loop Systems, Pipelines, Tanks, and More! Cortec® Corporation Appoints Macroplastic as Exclusive Regional Licensee for Anti-Corrosion Films and Bags! Cortec's CorrTainer Boxes Among 2017 Biggest Packaging Gateway Stories! Cortec® Corporation Helps Contractors Put Rebar Rust to Rest! Great Interest in Cortec's CorroLogic® Solutions at Stock Expo in Germany! NEWS ALERT: Another Class Graduates from Cortec® University! Cortec® Middle East - Great Success at ADIPAC- One of World's Most Influential Events for the Oil and Gas Industry! State-of-the-Art Perforator Equipment Expands Cortec® VpCI® Paper Perf Capabilities to 50 Inches! Vapor-Phase Protection against AST Soil-Side Corrosion-Now Faster Than Ever with CorroLogic® Nano VpCI® Powder! CE Certification Opens EU Market to Six Cortec&REG; MCI® Concrete Protection Products! Cortec® at Most Influential Oil and Gas Industry Event: Cortec Middle East to Present Latest Corrosion Protection Technology at the Abu Dhabi International Petroleum Exhibition! Cortec® R&D Creates Superior Reformulation of VpCI®-340 CLP with Extremely Low Freezing Point! Cortec® Welcomes Cambridge and Beli Manastir Delegations for CAF Groundbreaking Ceremony! Cortec® Coated Products Introduces EcoWeave - New High Tech Extrusion Coating Line! Cortec® Biotechnology Campus Improves Productivity and Turnaround Time with New Liquid Blending Line! Cortec's New "VpCI® Additives for Cleaners and Degreasers" Brochure - Uniting Corrosion Protection with Cleaning! EcoCortec® - Leading European VpCI®/VCI Plastic Films Producer Receives a Certificate of Credit Rating Excellence! NACE Materials Performance Double Features Cortec® Corrosion Solutions! Cortec's Innovative Flexible Packaging Solutions: Protect Against Corrosion - Protecting Your Assets and Profits! Custom-Made CorrTainer® powered by Nano VpCI® Boxes on Demand Produced in ANY Quantity at Cortec® Coated Products in Eau Claire, Wisconsin! New VpCI® Additives Brochure Presents Exciting AntiCorrosion Options for Coating and Paint Formulators! Cortec's 40th Anniversary Highlighted by "The Voice of the Water Treatment Industry"
Carte Dozio and Cortec® Successfully Present VpCI® Technology at Leading Conference Forum for Integrated Valve Technologies! Cortec® Releases White Paper on NASA Seawater Rinsedown Testing of EcoShield® 386! Cortec® Corporation Passes Quality Audit with No Non-Conformances! Cortec® Builds MCI® Relationships at 2017 ICRI Spring Convention! Cortec's Daughter Company Announces New Brochure: High-Tech Integrated Solutions for Corrosion Protection! Cortec® Named Top Player In the Global Organic Corrosion Inhibitors Market 2017! World's Largest VpCI® Film Extrusion Plant Plans Important Expansion of Facilities and Cutting Edge Recycling Program! Latest Migratory Inhibitor Technology- Powerful Corrosion Protection of Post-Tensioned Structures! Cortec® Makes Significant Contributions to NACE CORROSION 2017 Conference! Cortec's New VpCI® Additives Brochure Offers Comprehensive Range of Corrosion Inhibiting Options! Breakthrough in Temporary Rust Preventive Technology: EcoCorr™ Water-Based RP Offers Excellent Performance and 40 Percent Savings Against Bestselling Petroleum-Derived RP! Cortec® Launches 2017 World Sales Meeting Website and Counts Down to Festivities! Cortec® Expands Capabilities and Efficiency with On-Demand Box-Making Machine! Cortec® Advanced Films Improves Quality and Safety and Reduces Waste on Busiest Extrusion Line! Cortec® Receives Special Invitation to JSWAG-JFOWG! New Economical Environmentally Safe Corrosion Inhibitor For Multiple Applications Featured in IPCM Magazine! Cortec® Seeks Continued Education and Market Exposure at Purdue Short Course! New Economical Environmentally Safe Corrosion Inhibitor For Multiple Applications! Cortec's New MCI® Technology Brochure Tackles Age-Old Problem of Infrastructure Deterioration! Cortec® White Paper Explains the "Power of Diminishing Particle Sizes"
Bionetix® International Discovers Big Results at ISSA/INTERCLEAN Latin America! Cortec's New EcoAir® Mold Release Helps Protect Injection Molds, Castings, and the Environment! Cortec® Makes Important MCI® Connections at World of Concrete 2017! Cortec's High Performance Coatings Attract Attention at SSPC 2017! Cortec® Develops Specialized Ready-to-Use Rust Preventative Ideal for Tight Tolerances! Cortec® Lab Finds Six-Year-Old VpCI® Film Still Effective! Corpac Switzerland and Egolf Share VpCI® Solutions at Important Prodex Tool and Manufacturing Fair! Cortec® Celebrates 20 Years of Revolutionizing the Corrosion Inhibiting Industry at Cortec® Advanced Films! Celebrating 40 Years Offering Innovative Corrosion Control Solutions, Cortec® Corporation Announces The Upcoming 2017 World Sales Meeting! Cortec® Publishes Informative White Paper Detailing EcoSonic® ESD Paper Applications for EMS and MEAS Industries! Cortec® Corporation Certified to Test Vapor phase Corrosion Inhibiting Ability of Hydraulic Fluids! Cortec® Encounters Unexpected Opportunities andOffers Corrosion Solutions for all at Power-Gen®*! High-Tech Protector for Electrical and Electronic Devices Saves Money and Combats Corrosion! Cortec's EcoShield® Heat Sealable Paper Offers Flexible Custom Recyclable Packaging Solutions! Cortec® Corporation Awarded 63rd Patent in 40 Years of Business! Cortec® Celebrates Another Record-Breaking Year and Recognizes Employee Accomplishments! Important Industry Magazine Recognizes Cortec's Commitment to Discovering Natural Solutions! MCI® Technology Preserving War - Destructed Monument and Symbol of Croatian Independence! New Brochure from Bionetix® International Presents Environmentally Friendly Private Label Options! Cortec® Finds Good Name Recognition and New Ideas at World's Largest Packaging Show! Bionetix® International Provides Natural Solutions to the Growing Aquaculture Industry! Technical Excellence Article Published in the New Civil Engineer Magazine: Severn Bridge in UK one of 5 Most Beautiful Bridges in the World Protected with Cortec VpCIR Technology"
Latin American Sales Meeting Offers Time of Reunion and Renewed Vision! Revolutionary USDA Certified Biobased and Biodegradable System for Metalworking Industries Coming from Croatia! Cortec® and Valued Distributors Fill an Important Role at LATINCORR 2016! Bionetix® International Gains Valuable Insights at ISSA/INTERCLEAN 2016! Cortec's Exceptional, Environmentally Friendly Pipeline Casing Filler Product is Now Patented! Cortec® Corporation Sees Record Attendance at 2016 Asia Sales Meeting! Cortec® and Corpac Team Up to Reinforce Strong Market Presence at 2016 FachPack Show! Cortec® Corporation's Desalination Brochure Now Available in Portuguese! Save Time and Money with Cortec's EcoClean® Biodegradable Scale and Rust Remover powered by Nano VpCI®! Corrosion Adventure at EuroCorr and European Sales Meeting 2016! Bionetix® ENZA 4EL: Improve Cleaning Speed and Efficiency With Natural Enzyme Power! New Biotechnology Campus Brochure Showcases Cortec's Strong Commitment to Discovering Natural, Environmentally Friendly Solutions! Cortec® Corporation Featured Twice in August New Equipment Digest Magazine! Cortec's CorShield® VpCI®-146 Reinforced Paper: The Toughest Protective Packaging Paper For Sharp or Oddly Shaped Metals! Global Voice in Technical Coatings Solutions Publishes Cortec® VCI Transportation Coatings Article! Bionetix&REG; ENZA 4EP: Superior Multi-Purpose Cleaning, Waste Treatment, and Remediation with Enzymes! Cortec's Migrating Corrosion Inhibitors Create Longer Service Life for Existing Overpasses and Bridges! Cortec® Forever Changes the Anticorrosion Coating Business! EcoShield®386 is the First Water Based Coating Ever with Salt Spray Resistance of Over 1,000 Hours in ASTM B117 Test! Cortec® Named A Major Player In The Global Water Treatment Chemicals Market! World's Largest Producer of Anticorrosion Packaging Announces its Latest Breakthrough Product: EcoShield® Nitrite Free Film powered by Nano-VpCI™, Patent Pending! Reach New Heights of Corrosion Control with Cortec's "VpCI® Technology for Aircraft, Aviation, and Aerospace Industries"! First Distributor Training at EcoCortec® Plant! Cortec® Attends The 2016 Caterpillar Corrosion Engineering Conference! Cortec® CorrLube™ VpCI® Lithium EP Grease: Longer Lasting Lubricant Offers Corrosion Protection on Electrical Connections! Cortec's "VpCI® Technology For Desalination Industry" Brochure Featured In May Issue of Coatings Pro Magazine! Cortec's VpCI®-371 Coating: Innovative Corrosion Protection That Reduces Manufacturing Costs! Corpac Represents Cortec® VpCI® Technology at EMPACK 2016! Safe Corrosion Inhibitor for Food Can Protection, Strong on Corrosion - Super Gentle on Food! Fight The Flames With Cortec's VpCI®-126 Flame Retardant Film! PCE International Magazine Features Cortec's Offshore Platform Caisson Legs Protection! Cortec® Corporation Welcomes Back James E. Holden, P.E.! Cortec's "VpCI® Technology For Transportation and Municipalities" - Sustaining The Heartbeat Of Your City! Cortec® Announces Its 500th Case History On Inhibiting Corrosion Across The Globe! Cortec's New Brochure: "VpCI® Technology for Food, Beverage, and Pharmaceutical Industries" - Amazing Technology For Industries That Sustain The World! Cortec's MCI® HPRS® Produces Amazing Results And Sharply Lowers Corrosion Rates In Concrete! Cortec's CorShield® VpCI®-148 Oil And Grease Resistant Paper Powered By Nano-VpCI™ Solves Corrosion Problem Of Leading German SUV Manufacturer! Cortec® Corporation Conducts Preservation Project on Saadiyat Island! Cushion and Protect with Cortec's New Cor-Pak® Dunnage Bags Powered by Nano VpCI™, Patent Pending! BioCorr® Receives EU Trademark Approval, Strong on Corrosion - Gentle on Nature - Easy on the Wallet! Cortec® Brings High Performance Nano VpCI™ Coating Technology to the 2016 SSPC! ABC Concentrates - Missing Link Between Environmental Protection and Effective Treatment! Cortec's "VpCI® Technology for Automotive Industry" Brochure is Now Available in Portuguese! Three Cortec® MCI&REG; Products Mitigate Ongoing Corrosion! Cortec® Presents New MCI® Admixtures Brochure: Simple, Sure, Safe Technology For Extending Concrete Service Life! "Peel" Off Your Corrosion Problems with MCI® Peel-Off Coating! Cortec® Announces New Video Visualizing Nano VpCI® Coatings Technology! Stripping Has Never Been Easier - Use Cortec's New VpCI®-372 Temporary Coating! Cortec® Presents New Brochure - VpCI® Technology for Chemical Processing Industry! Cortec® Unveils New Website for Micro-Corrosion Inhibiting Coatings™ Powered by Nano VpCI®! Successful CORCON-2015 Leads The Way For Corrosion Control Bureau Of India! Cortec® Featured Twice In December 2015 Issue Of New Equipment Digest! Cortec's VpCI®-329 D Now Available In Easy Spray Formula - Convenient Corrosion Protection For Your Assets! Cortec® Lab Finds 20 Year Old Cortec® Emitter Still Provides Excellent Corrosion Protection! Cortec® Middle East Sponsors Technical Seminar For Ministry Of Water And Electricity (MOW&E) - General Directorate Of Water Eastern Province! Cortec® Advanced Films Increases Efficiency on Extrusion Line 21! Cortec® and Bionetix® Featured In November/ December Issue of Pollution Equipment News! Cortec® Publishes New Brochure Highlighting Micro-Corrosion Inhibiting Coatings™ Powered By Nano VpCI®! Cortec's Cor-Pak® VpCI® Static Dissipative Bubbles Powered By Nano-VpCI®: Smart Solution For Your Packaging Needs! New Equipment Digest Features Cortec® EcoFog® VpCI®-309 Nano And CorShield® VpCI®-146 Creped Paper In Their October Issue! Cortec's CorShield® VpCI®-649: Environmentally Safe Solution For Heating And Cooling Systems! Cortec's New VpCI®-280: Fast Drying Topcoat You Won't Have To Wait For! Pollution Equipment News Features Three Cortec® Articles in August/September Issue! Cortec® Attends Exponor 2015 As The Only Corrosion Prevention Solution For The Mining Industry! Multinational Giant Bosch Utilizing EcoCortec®'s High Tech, CoExtruded Static Dissipative Bags! Cortec's New "VpCI® Technology for Off-Road Equipment and Mining Industries" Brochure Now Available! Cortec's Commitment to Quality, Excellence, and Leadership Shine Through With ISO/IED 17025, ISO 9001:2008, and ISO 14001:2004 Recertifications! 2015 Cortec® India Sales Meeting - Celebrating 10th Anniversary Of Incorporation! Cortec® Presents New Brochure - VpCI® Technology No. 1 choice for Marine and Shipbuilding Industries! EcoFog® VpCI®-309 Nano: Corrosion Protection For Hard to Reach Areas! CorShield® VpCI® -146 Creped Paper: Packaging For Multi-Metal Corrosion Protection! 08/12/15 NEWS ALERT: Cortec's VpCI® -643 Featured In July Issue of CoatingsTech Magazine! News Alert: Cortec's Corrblock™ Featured in June Issue of Power Engineering Magazine! Bionetix® Bioaugmentation Products: Preparing The Industry For Season Changes! Cortec's VpCI®-391: A Non-Tacky Water-Borne Coating For Long Term Protection! Bioremediation Product Successfully Used for Environmentally Safe Treatment of Refinery and Chemical Waste! Cortec's VpCI®-643 Featured in Hot New Products Editors Choice Section of New Equipment Digest! Cortec's New Brochure "VpCI® Technology for Oil and Gas Industry" Now Available! Cortec® Presents June 2015 Supplement To Materials Performance Magazine! CorShield® S-69 - Powered by Nano VpCI® - Environmentally Sound and Cost Effective Solution for Water Treatment Industries! Cortec's EcoLine® Food Machinery Lubricating Grease Featured In June Issue of Industrial Equipment News! Cortec® President/CEO - Boris Miksic, FNACE Shares His Journey As A Keynote Speaker At The 2015 NACE Corrosion UAE! Cortec's New "Smart Packaging Powered by Nano-VpCI®" Brochure Is Now Available! Cortec's CorrBlock™ Featured in May Issue of Water World Magazine! Cortec's High Performance Lubricant Brochure and VpCI®-126 UV Film Featured in May Issue of New Equipment Digest! CorShield® VpCI 146 - Environmentally Safe and Economical Replacement for Toxic Nitrite Coated/Impregnated Papers! Cortec's BioCorr® ATF Rust Preventative: Biodegradable, Biobased, and Sustainable Corrosion Protection for the Automotive Industry! Cortec® Promotes MCI® at MADE EXPO! Cortec® President/CEO - Boris Miksic, FNACE To Be Keynote Speaker At Corrosion UAE! Cortec's New Automotive Brochure Now Available! Cortec® Corporation's VpCI® and MCI® Technology Presentations Now Available Online! Nitrite Free Cortec® VpCI®-146 Paper: Global Packaging Solution For The Automotive Industry! Cortec® Recognized for Innovative EcoAir® Technology! Cortec® Announces ISO 9001 Recertification Completed With NO Non-Conformances - Proving Quality And Excellence Are The Number One Priority! Latest State Of The Art Packaging Solution: High-Tech Corrosion Protection from Aggressive Environments and UV Exposure! Cortec® Introduces VpCI®-386 HT Black: High Heat Resistant Coating Solution For Any Application! CorrShield VpCI®-379 - Tough on Corrosion Easy On Your Wallet! Cortec® Middle East Regional Meeting Sets The Path For A Successful 2015! Cortec® Middle East Sponsors Technical Dinner Meeting At NACE Jubail-Saudi Arabia! Cortec® Middle East Launches The First Integrated Corrosion Solution Partnership In The Kingdom Of Saudi Arabia! Cortec® VpCI®-705 Featured In February Issue Of Oil & Gas Engineering! CorrBlock™ - Slow Release VpCI® Containing Block Top-Notch Corrosion Protection in Cooling and Waste Water Systems! Cortec® Recertified For ISO 14001:2004 - Continuing Dedication To Excellence! Cortec® Featured Twice In Coatings Pro Magazine! PRESS RELEASE: Cortec® Presents VpCI® -406: Protecting Your Vehicle This And Every Winter! Cortec® Featured In December Issue of Chemical Engineering! Latest Export Packaging Advancement from EcoCortec® d.o.o. Croatia Custom Fabricated Equipment Covers and Hoods Powered by Nano-VpCI®! Cortec® Presents EcoClean® VpCI®-434G & VpCI®-434L Eco-Friendly Paint, Graffiti, and Gasket Removers! 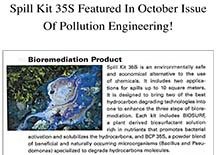 Spill Kit 35S Featured In October Issue of Pollution Engineering! Boost Engine Power and Cut Repair Costs With VpCI&REG;-705 Bio Fuel Additive Powered by Nano VpCI&REG;! Cortec® Dominates PackExpo With Innovative Packaging Technologies! Cortec's New VpCI® Additives Brochure Now Available! Cortec® Brings Global Innovation To LatinCorr 2014! Bionetix ® ECP 57 - Enzyme Blend for Complex Grains and Woody Material Breakdown! 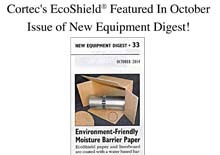 Cortec's EcoShield® Featured In October Issue of New Equipment Digest! Europe's Biggest VCI/VpCI® Plant Just Got Bigger! Cortec® Corporation's "Corrosion Inhibiting Vapor For Use In Connection With Encased Articles" US Patent Number 8,800,224 Was Published August 12th, 2014! BioPouch™ Powered by a NANO-VpCI®-Latest Breakthrough in Corrosion Protection Technology! Cortec® Middle East Continues To Strengthen Its Partnerships With Local Academic Institutions Through The Cortec® Internship Program! Preservation For The New Millennium - Cortec® VpCI®-126 Blue and VpCI®-386! Find Out What Multi-Purpose Really Means With Cortec®'s EcoClean® VpCI®- 411 Cleaner/ Degreaser! 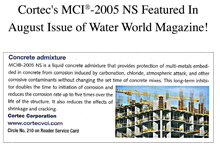 Cortec's MCI®-2005 NS Featured In August Issue of Water World Magazine! 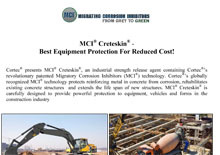 MCI® Creteskin® - Best Equipment Protection For Reduced Cost! Improving Sustainability, Quality, and Carbon Foot Print at Cortec® Advanced Films in Cambridge, Minnesota! Cortec® Corporation Only Laboratory in VCI Industry ISO/IEC 17025 Accredited! Cortec's MCI®-2012 IntegraPel Featured In WaterWorld Magazine! Cortec's "Bio-Based Corrosion Inhibitors" US Patent Number 8,795,589 Published August 5, 2014! Cortec® Presents Advanced Corrosion Inhibitor Technology To AHK Santa Catarina - Brazil! Cortec's CorShield® VpCI®-386 HP Featured In July Issue of Coatings Pro Magazine! Reduce Your Processing Costs and Increase the Time of Remediation! Cortec&REG; M-141, Cohesive Strength in Your Hands! Cortec's MCI® Wall Defense Featured In July Issue of Portable Restroom Operator! New EcoShield® Environmentally Friendly Moisture Barrier Paper - Complete Replacement for PE and Wax Coated Papers! Cortec® Middle East Hosts "How to Grow your Cortec Business"! Cortec's M-528: Provides Corrosion Protection In Harsh Subsea Environments! Cortec's 1st Edition of "Improving Durability of Infrastructure with Migratory Corrosion Inhibitors (MCI®) Handbook" Now Available! Bionetix Setting High Standards With ISO 9001:2008 Recertification! Cortec® Attends RAILCORR 2014 Seminar! Cortec® Corporation Celebrates 20 Years Of ISO 9001 Certification! Cortec® EcoSonic VpCI®-105 Emitters Featured in May Issue of Chemical Engineering! Cortec's MCI®-2005 In Al Jalila Hospital Featured At Zawya! Bionetix Porta-Treat Featured In May Issue of Portable Restroom Operator (PRO) Magazine! Cortec® MCI®-2005 Used In Al Jalila Pediatric Care Hospital Project! Cortec's CorrVerter® Featured in April Issue of Pollution Equipment News! Cortec's EcoLine® 3680 Featured In April Issue of Pollution Engineering! Cortec® Introduces CorShield™ VpCI®-386 HP powered by Nano-VpCI®: The Next Generation Of High Performance Coatings! Cortec's MCI®-2012 Integrapel Featured In April Issue of Coatings Tech Magazine! Bionetix® Porta-Treat Featured In April Issue of Pumper Magazine! Cortec's BioClean® Spray Featured February Issue of Pollution Engineering! Cortec® Featured In NACE Corrosion Press! Bionetix® All Purpose Odor Eliminator - Clears The Stink Faster Than You Think! Cortec's VpCI®-637 TOL Featured March Issue of Waste / Wastewater International! Restoration of Ferrari/Pininfarina legend using VPCI- NANO® Technology (Vapor phase Corrosion Inhibitor)! VpCI® Super Penetrant Featured In March Issue Of New Equipment Digest! Cortec® VpCI®-143 Paper Emitters: More Convenient Packaging Solution! Bionetix® Eco Sept Featured In March Issue Of Pumper Magazine! Cortec® M-531 T: Oil-Based Additive Package Of Ash Free Corrosion Inhibitor! Cortec's CorroLogic Brochure Featured In Free Literature Section of Process Coolings March Issue! Cortec® EcoLine® Cutting Fluid Withstands Bitter Cold! Cortec&REG; CorPak&REG; Tablets Featured in January/February Issue of Machinery Lubrications! Cortec's New MCI®-2012 IntegraPel: Prevents Corrosion Of Steel Reinforcement In New Structures! New Equipment Digest Features Two Cortec® Articles In February Issue! Cortec® VpCI®-132 Foam Pads Featured In February Issue of Lubes'N'Greases! Superior Multi-Metal Corrosion Protection in Any Enclosure! "Miksic Achieves 40 Years At NACE" Featured in February Issue of Materials Performance! New Equipment Digest Features Two Cortec® Articles In January Issue! Bacto-Control - Newest Method for Rational and Safe Crop Management! Cortec's EcoLine® 3680 Featured In January Issue Of Materials Performance! Cortec® VpCI® Coatings Outperformed Competition in NASA Research Project! Cortec's BioClean® Spray Featured In New Equipment Digest! Cortec® Now Registered With Cefas - OCNS! Corrosorber® Paper - Tarnish Inhibiting Packaging Powered by Nano-VpCI®! Biopad®-Biobased Fabric Powered By Nano-VpCI®For Corrosion And Surface Protection Of Multi-Metals! Cortec's VpCI®-328 Featured In Industrial Equipment News Magazine! Cortec's VpCI®-144 Featured In New Equipment Digest Magazine! Cortec® Represented At Vital Tradeshows Globally By Our Representatives And Distributors! Latest Technology for Biological Waste Treatment Bionetix International - Presents its New Improved Product Lines! Cortec's MCI-2019 Featured inCoatingsPro Magazine! Don't Squeal About Corrosion Issues - Use Cortec's CorroLogic Systems VpCI-639 & VpCI-639 HFB For Hydro Testing And Pigging Of Pipelines! Premium Corrosion Protection Paper in the Industry- Safe, Economical and Super-Effective! Cortec Cor-Pak Tablets Featured in September Issue of New Equipment Digest! Cortec's ElectriCorr VpCI-286 Conformal Coating: The Smartest Choice For Your Electronics! Cortec VpCI-637 TOL Featured in July/August Issue of Upstream Pumping Magazine! Cortec VpCI-637 TOL Featured in July Issue of Pollution Engineering Magazine! Cortec MCI-2019 Featured in July Issue of Buildings Magazine! VpCI-132 Foam Pad - Global Industry Standard for Export Packaging! Cortec's 3rd Edition Of The Preservation, Lay-Up, & Mothballing Handbook Now Available! Cortec MCI-2019 Featured in June Issue of Coatings World Magazine! Have a Corrosion Headache?...Take a Pill! Cortec Announces VpCI-328 - Excellent Lubrication and Corrosion Protection In One! Cortec CorShield VpCI Transit Coating Featured in May/June Issue of Green Manufacturer Magazine! Cortec Announces VpCI-398 Undercoat Powered by Nano-VpCI Your Vehicles Should Never Rust Out! Cortec MCI Wall Defense Featured in June Issue of Industrial Equipment News Magazine! Cortec CorrLube Food Grade Penetrant Featured in June Issue of New Equipment Digest Magazine! Historic Zagreb Cathedral Restored with Cortec! Bionetix International Announces Its New Fire Damage Deodorizer! Cortec Closed Loop Toad Featured in May/June Issue of Industrial Waterworld Magazine! Restoration of Drilling Tools Utilizing Environmentally Safe and Super Effective VpCI Technology! Cortec Website Featured in May Issue of CoatingsPro Magazine! Cortec MCI Wall Defense Featured in April Issue of Buildings Magazine! Cortec's "Anti-Corrosive Corn Extracts" US Patent Number 8,440,095 Awarded May 14, 2013! Cortec VpCI Super Penetrant Featured in April Issue of Pollution Equipment News! Bionetix Bio-Tab 1T: Enhance Water Biology in Septic Systems! Revolutionary System for Top of the Line Corrosion Protection of Pipelines! Cortec CorShield Featured in April Issue of Coatings World! Cortec VpCI-337 Featured in February/March Issue of Water World International! Enhanced Solution for Surface Preparation of Multiple Metals! Cortec VpCI-390 Featured in April Issue of Concrete Repair Bulletin! Cortec Announces M-533 FG Anti-Corrosion Additive For Food Grade Lubricants! Cortec VpCI Super Penetrant Featured in April Issue of New Equipment Digest! Cortec Profiled In Freedonia Study For Corrosion Inhibitor Market! Cortec's MCI-2019 Sealer Latest Technology for The Preservation of Concrete Structures! Cortec MCI Wall Defense Featured in March Issue of Coatings Pro Magazine! Cortec's "Bio-Based Corrosion Inhibitors" US Patent Number 8,409,340 Was Published April 2, 2013! CorroLogic™, The Blueprint of Cortec CEFS Custom Engineered Corrosion Solutions! 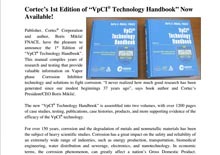 Cortec VpCI-148 Featured in January Issue of BioFibre Magazine! Non-Toxic Cooling System Toads Against Global Warming! Cortec Announces 23rd World Sales Meeting! Cortec Cor-Pak VpCI Stretch Film Keeps Unruly Shipments Under Wraps! Cortec's EcoLine 3220 and 3690 Featured in January-February Issue of Machinery Lubrication Magazine! BioWrap powered by Nano-VpCI - The Latest High-Tech Packaging Solution! Cortec's M-605 PS Awarded BioPreferred Labeling! CorShield VpCI Transit Coating - Superior, Environmentally Safe Replacement for Hazardous Corrosion Preventives! Cortec Introduces Cortec Biotechnology - Creating New Bio-Economic Opportunities! Solve Your Protective Coating Problems With Cortec's VpCI-390! Cortec Profiled in January Issue of Coatings Pro Magazine! Cortec VpCI-148 Featured in December Issue of BioCycle Magazine! Cortec® CorroLogic™ System for Cased Pipeline Crossings Featured in December Issue of Materials Performance Magazine! Cortec's VpCI-426, Formulated Three Ways To Clean, Protect, & Preserve! Cortec's CorrVerter® - Two Custom Colors Now Available! MTBE Manufacturing Plant in Dubai Preserved in Record Time! Cortec® Nominated For The MP Readers Choice Corrosion Innovation of the Year Award! Cortec Asia Pacific Meeting Concludes in Gangnam Style! Cortec CorroLogic Featuredin November Issue of Materials Performance Magazine! World Renowned Severn Bridge Preserved with Patented PTC Emitters! Cortec EcoWorks Featured in September Issue of Biocycle! Cortec VpCI-609 Powder Featured in June Issue of Pollution Equipment News! The Only Right Choice for Surface Preparation! Cortec VpCI-325 Featured in August Issue of New Equipment Digest! Cortec® Corporation Completes Phase VI Expansion To The World's Largest VpCI®/MCI® Synthesis Plant! Let The Light Shine Through With Cortec's MCI® Window Protector! Cortec's Eco Tire Duragloss: High Gloss Shine Without Solvent Or VOCs! Cortec's VpCI®-428: Powerful Punch Against Aluminum Oxides and More! CorteCros: Cortec's First Joint Venture Still Going Stonger Than Ever! Remove Rust, Scale, And Tough Concrete Residue With Cortec MCI Super Remover! Cortec's VpCI-395 Featured in July Issue of Biocycle. Cortec EcoWorks® AD: Biobased Film That's Environmentally Friendly From Beginning To End. Cortec's VpCI-125 Film Featured in May Issue of Packaging World. Cortec Featured in April Issue of Lubes'N'Greases. Biobased Rust Preventative for Precision Machined Metallic Surfaces! HITEK-nology Solutions LTD Exhibits at DVD Conference. Cortec Has A New Face And New Office in Kansas! Cortec EcoOcean™ Featured in Middle East and India Coatings & Converting. Cortec's Organic, Biodegradable VpCI-422 Rust Remover: Free of VOCs, Solvents, & Phosphates. Cortec Corporation Presents MCI CorteCure®, A Biobased Concrete Curing Compound Boasting Superior Corrosion Protection. Environmental Breakthrough with Cortec's EcoAir® Product Line! Cortec Corporation Wins Small Business Success Story Award from Twin Cities Business Magazine. Cortec's BioPreferred Products Featured in November/December Issue of Concrete Repair Bulletin. Cortec VpCI-380 Featured in November/December Issue of Concrete Repair Bulletin. VpCI-337 - Quick and Easy Corrosion Protection! Cortec Corporation Announces VpCI-126 TRF: An Anti-Corrosive Film That Stands Up To The Heat Of Industrial Work. Cortec Featured in August Issue of BioCycle Magazine. Cortec Showcased in September Issue of Materials Performance Magazine. Cortec Announced As Finalist By Twin Cities Business Magazine! Cortec VpCI-380: Weatherproofing for the Long Haul! Cortec Adds to its List of Approved USDA BioPreferred Products! Cortec MCI-2018 V/O; Creating a Strong Bond for Corrosion Protection! Cortec's S-7 Liquid for Rapid Oxygen Removal! Cortec CorPak® Stretch Film Featured in May Issue of Spray Technologies Magazine! Cortec's EcoLine® CLP, The Green Way To Protect Machinery Parts From Friction And Corrosion. New From Cortec : CorroLogic™ VpCI Filler Seals Interstitial Spaces and Provides Long-Term Control of Corrosion. Cortec MCI POWR: Extends the Life of Reinforced Concrete Structures. Cortec Products Certified for USDA BioPreferred biobased labeling! Cortec M-531 Provides Protection Like No Other! Revolutionary Wipes Remove Rust, Oil and Dust! Cortec Unveils New and Improved MCI Website! Go Greener with Cortec EcoAir® for FREE! Cortec Corporation named a finalist for 11th annual Tekne Awards! MCI Wall Defense is tough enough to face Mother Nature and vandals. Cortec announces EcoEarth™ product line, EcoEmitter®, and a glimpse of the future in corrosion protection. Cortec EcoPrimer: A Bio-Based Solution to Corrosion. Cortec HC products for drinking water pipeline applications. Cortec Eco Works® Bags comply with new state law. The Wisconsin Department of Natural Resources has qualified Cortec Spray Technologies Wisconsin Green Tier Program. Cortec's New FlashCorr VpCI removes salt build-up while protecting from corrosion. Cortec's New Corrosorber® Liquid: Non-hazardous gas treating scavenger. Cortec Websites Bursting With Innovative Renovations! Cortec Launches Corrosion Engineering and Field Services Worldwide. Cortec's EcoWorks Resin now available for your film production needs. Cortec Launches Three New Websites to Meet Customer's Needs. Cortec Launches New Website for Packaging Solutions. Cortec Products for Hydrotesting / Lay-Up. Oxo Additives Create More Problems Than They Solve. CCP 'Recovers' $170,000 from Innovative Heat-Recovery System. Cortec 'Rocked' the 2009 World Sales Meeting. Cortec Weekly Email Has A New Look! Cortec's BioPad® Offers Two Times More Protection Than Other Packaging! Cortec has a new voice! Cortec India's 2nd Training and Sales Conference is Naturally a Success! Cortec's Free Mothballing Manual: A concise guide of proven solutions to protect assets. Cortec Corporation Celebrates 15 Years of ISO Certification! Cortec Spray Technologies - Were Back and Better Than Ever! Eco Works now produced simultaneously in North America and Europe. Cortec's Desicorr® and Desicorr® VpCI Pouches: Larger Sizes For More Protection. Cortec Teams up at 17th Annual USCC Conference. Cortecs VpCI Becomes a Registered Trademark. Cortec Unveils New and Improved MCI Website. Cortec Provides New Website for Water Treatment Solutions. Reduce Your Costs and Protect Your Equipment with Cortec's MCI Creteskin™. Cortec's Cor-Pak® VpCI Masking Film Wont Leave You Sticky. Cortec Eco Works - Not Your Average Bag. Cortec's CorrTainer named packaging of the year. Cortec's Mothballing Manual: A concise guide to proven solutions. Cortec strives to keep its employees safe and to comply with the OSHA laws. More RoHS and SGS Reports Available for Key Cortec Products! New use for Cortec VpCI: Inhibicards by Inhibisystem. Cortec Corporations MilCorr VpCI Shrink Film wraps up the Marines. Cortec European Sales Meeting 2008 - Double Success. Cortec part of innovative video business profiles. Struggling with scale formation? Take control with Cortec! Cortec product launch successful in Ecuador. Cortec announced as finalist for ninth annual Tekne Awards! Cortec primer provides long-term protection in a corrosive atmosphere. Cortec is excited to announce its 3rd generation masterbatch M-126/3. Cortec sealer protects 31 year old bridge! EcoLine provides historical bridge with needed protection in Hawaii! Unbeatable Corrosion Protection While Protecting the Planet! A Crucial Green Building Block for Cooling Systems! New Record for Cortec Advanced Films! Cortec Creates Innovative Earth-Friendly Product! Cortecs Christophe Chandler PhD contributes to NACE standard on VpCIs. Cortec Corporation Always Improving on Productivity! Cortec Corporation Announces Stock Products for European Market. Eco Wrap Biodegradable Film Crosses the Ocean!